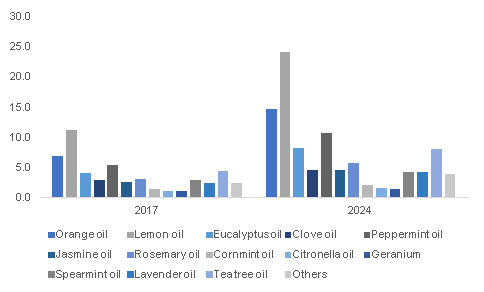 Essential Oils Market size was over USD 7.16 billion in 2017 and industry expects consumption of above 350 kilo tons by 2024. Increasing consumer adoption towards alternative medical treatments like aromatherapy over conventional pharmaceutical drugs will drive essential oils market size. It provides natural healing solutions for insomnia, respiratory diseases, immune system functioning skin issue and digestion problems which has promoted its usage in aromatherapy application. Global aromatherapy market may surpass USD 2 billion by 2024.Growing importance of natural & herbal treatment along with rising economic standards has increased essential oils demand. Growing reliability over natural and organic ingredients in cosmetic formulations is likely to promote product demand. Global organic cosmetics market may exceed USD 20 billion by 2024. These oils have wide applications in skin care, perfumes and hair care products for fragrance, natural preservation and therapeutic qualities including skin rejuvenating, antiaging, hair fall control and dandruff. Shifting consumer preference towards sustainable natural ingredients with multifunctional qualities will propel essential oils market growth. Global pharmaceutical market may witness gains over 6.5% by 2024. Essential oils find application in pharmaceutical drugs owing to their fungicidal, bactericidal, antiparasitic, insecticidal and virucidal effects which promotes its application to treat skin disease, dental issues and respiratory problems. Growing R&D expenditure in pharmaceutical industry to innovate new active ingredients along with examining essential oils activity in cancer treatment will foster product demand. Stringent storage and transportation condition also commercial manufacturing is labor intensive industry incurring additional cost which may hamper industry profitability, thus affecting essential oils market price trends. Health issues concerning with excessive use and suitability of the product may act as another restraining factor. Essential oils market from orange oil market size may account for 80 kilo tons by 2024. It has an extensive application in food, cosmetics, home care, and wellness owing to its nontoxic nature which do not cause any reaction on use which is likely to surge product demand. Rising demand for aromatic oil in hospitality sector for diffusers and room fresheners will promote industry growth. Growing production and cultivation of oranges owing to sustainable agriculture techniques will favor product demand by ensuring continuous supply of raw material. Essential oils market from lemon oil may surpass USD 2 million at the end of 2024. Lemon oil is an effective cleansing agent along with key properties including detoxifying, antifungal, astringent and anti-inflammation which promotes its use in soaps, face washes, shampoos and scrubs, thus propelling industry growth. It is also a flavoring agent for varied food products and beverage. Its unique and distinct aroma makes it suitable for perfumes and other toiletries such as disinfectants, dish washes, handwashes, and room fresheners. Eucalyptus oil of essential oil market may witness significant gains at over 9.5%. This oil helps in addressing sinus, bronchitis, coughs and respiratory infections. It has wide applications in pharmaceutical products like cough drops, lozenges, ointments and liniments. It also finds application in dental products like toothpaste, mouth washes along with perfumes and cosmetics like shampoos, facewash and scrubs. Peppermint oil of essential oil market is likely to witness steady gains over the forecast timeframe. It is a medicinal herb as well as flavorful culinary addition mainly in teas, soaps, tooth paste, candies, stomach medicines and mouth washes. It helps in combating bad breath and uncomfortable breathing problems. It also has application for in skin care products to sooth sunburn, itchiness and painful irritations, thus propelling industry growth. Essential oils market share from food & beverage application may account for 145 kilo tons at the end of 2024. Rosemary, clove, peppermint, orange, lemon, cinnamon and black pepper oil are widely used in food & beverage application for cooking and flavoring purpose. Supporting regulatory norms by FDA regarding approval of these oils in food & beverage application will have positive impact on product demand. Plant based oils are also useful for their antioxidant and antimicrobial traits, thus making them suitable for natural preservation. Increasing usage of the product for shelf life extension owing to growing consumer awareness regarding natural preservatives will favor industry growth. Essential oils market share from aromatherapy application may surpass USD 2.5 billion by 2024. Gaining popularity of aromatherapy as a potential replacement for pharmaceutical drugs which along with rising consumer health consciousness regarding health management through balancing mental and physical well being will favor market growth. The oils travel through skin penetrate easily and promote whole body healing. Europe led by France, Italy, UK and Germany essential oils market size may witness strong gains at over 9% by 2024. Presence of large number of cosmetic production companies in this region will drive regional industry growth. Consumer inclination towards natural ingredients in cosmetic products along with environmental sustainability of these material will surge regional product demand. In addition, supporting import policies which proposes no restrictions on the imports of essential oils may act as another contributing factor towards regional market growth. Asia Pacific led by India, Japan, South Korea and China essential oils market is poised to surpass USD 4 million by 2024. Growing usage of supportive agriculture techniques mainly in India and China resulted in increased production of certain plants like orange, lemon, peppermint, clove which may ensure fair supply of raw material for oil production which may drive industry growth in this region. Moreover, emerging trend of spa & relaxation along with increasing consumer spending on wellness may propel regional essential oil industry growth. 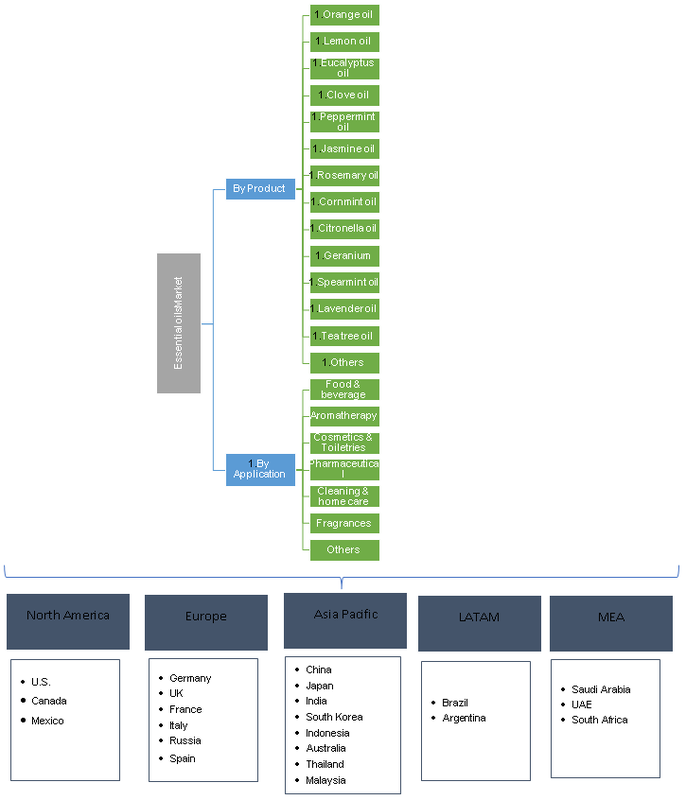 Global essential oils market share is moderately fragmented and competitive with major players operating in this industry includes DoTerra, Bio Landes, Young Living, Firmnich and Symrise, Frutarom, Flacon. Other companies present in the industry includes Lebermuth, Moksha Lifestyle, Florihana, Rock Mountain Oils, BoInternational, and Flavex. Key players are investing in R&D to develop oil blends for aromatherapy and preservation application. They are also enhancing the extraction and storage techniques increase efficiency of the oil. Essential oils are the complex compounds extracted from plants. They are made from parts of plants including herbs, barks, rinds, and leaves. Makers use different methods to concentrate them into oils. They are highly volatile, concentrated aromatic essences of plants and has aromatic and flavoring qualities which makes them suitable for food & beverage, aromatherapy, cosmetics, home care & cleaning and fragrance application. Availability of varied product range along with change in lifestyle which has resulted in varied health issue has promoted product demand.